It's the ultimate party kit for Munchkin fans! Munchkin players really like to combine their sets . . . Munchkin, Star Munchkin, Munchkin Fu, all in one game. That gets really weird . . . but it can also slow the game down. There are also a lot more monster enhancers . . . and ITEM enhancers, too. There are several new low-level monsters to help you get those easy kills. Unless somebody takes that Sock Puppet and turns it into the Ultra-Rare Extremely Sneaky Sock Puppet With Extra Cheese . . . This set also includes the complete, updated Epic rules, covering all races and classes released in every Munchkin game so far. Munchkin till you drop! Munchkin Blender -- just add players! 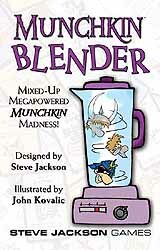 The RDG Team hasn't gotten around to writing a review for Munchkin Blender. YET. We're writing up new reviews all the time. (And adding new games to review!) And this one is on the To Do List. But we could really use your help! If you'd like to say a word or two about Munchkin Blender, click here and we'll put it online!